Reading and share top 5 famous quotes and sayings about Basket Weaving by famous authors and people. 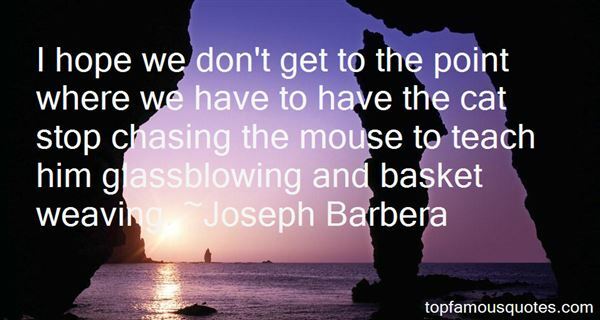 Browse top 5 famous quotes and sayings about Basket Weaving by most favorite authors. 1. "I have hobbies," he says, smirking. 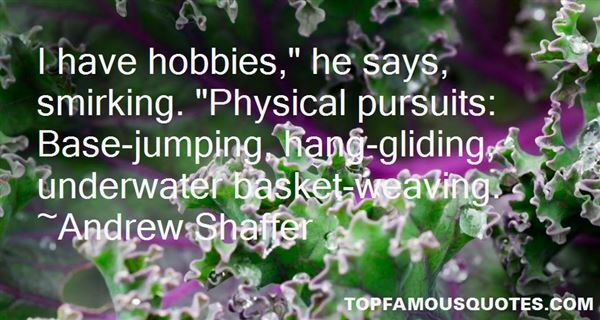 "Physical pursuits: Base-jumping, hang-gliding, underwater basket-weaving." 2. "The basket would never make her famous or end up in a museum. The best part of it was the making of it, sitting at the table weaving while outside the lake crashed into shore and the seagulls roosted somewhere for the night and two women stopped for a moment to watch." 3. 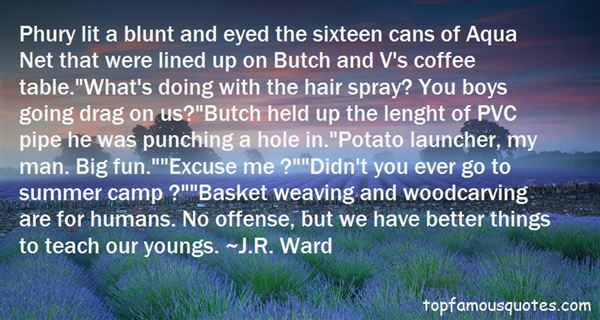 "Phury lit a blunt and eyed the sixteen cans of Aqua Net that were lined up on Butch and V's coffee table. "What's doing with the hair spray? You boys going drag on us? "Butch held up the lenght of PVC pipe he was punching a hole in. "Potato launcher, my man. Big fun. ""Excuse me ? ""Didn't you ever go to summer camp ? ""Basket weaving and woodcarving are for humans. No offense, but we have better things to teach our youngs." 4. "I hope we don't get to the point where we have to have the cat stop chasing the mouse to teach him glassblowing and basket weaving." 5. "As I went to college, I went into radio and television. Now I suppose most people think that's one step ahead of basket weaving as a major in college, but it was part of the journalism department." The sharing of a book is a statement—a message of affection that is also an act of self-revelation. Join my club, it says. Come and sit beside me."